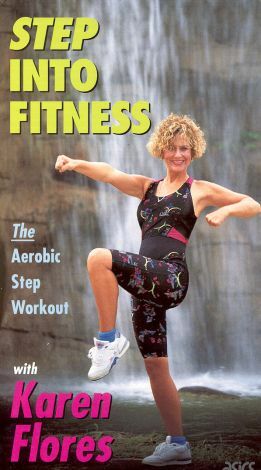 A traditional yet fast-paced aerobic workout is delivered with Karen Flores -- Step into Fitness. As a registered nurse, Flores understands the value of cardiovascular health. Hers is a straightforward approach using a step unit and simple movements. The scenery does offer a respite from the usual one-room location for exercise videos. In Step Into Fitness, Flores takes the viewer to Guam to work out at the foot of a waterfall. After the warm-up, the class moves into a lengthy step segment composed of mostly up-and-overs. Flores also adds a short arm portion at the end.